The design of an efficient and cold effective on site treatment system (OWTS) ensures performance, longevity, and protection of the environment. The design of the system for your property requires site visits, soil testing, assessment of building occupancy and use, and the creation of a site plan. The investment in site assessment and design is the most valuable expenditure you can make. At Cold creek Excavating, we are committed to our customers. As a designer, we will recommend one or more systems suitable for your property, based on flow rate, the land area available, and the soil conditions. We take pride in our company and in the protection of the environment as well as supplying cost effective high quality septic designs and septic system installations. Professional systems are designed to treat the effluent fully and disperse it with little or no impact to the environment and have a long effective life. A quality on-site system is now seen as a real estate asset. 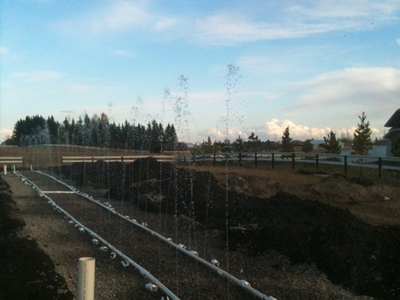 Cold Creek Excavating is PSDS Certified, meaning that we can apply for Private Sewage Disposal System Permits, and we are a proud member of the Alberta Onsite Waste Water Management Association. We pride ourselves on providing all customers with professional service that protects human health and is environmentally friendly. Please don’t hesitate to call regarding any questions you may have.